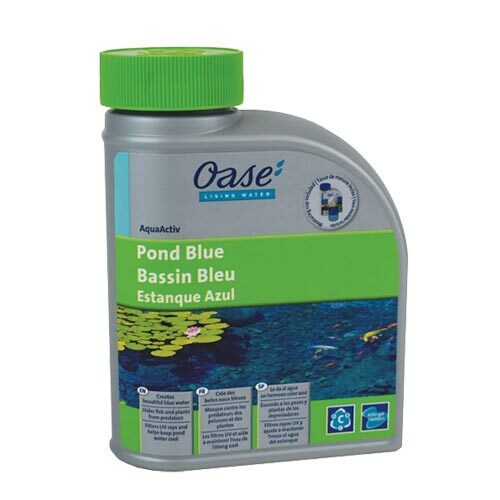 AquaActiv Pond Blue enhances the look of your pond, fountain and water feature by creating beautiful blue water. Adding this product to your water has multiple benefits. It can provide shade by blocking harmful UV rays that can create algae blooms in your pond. It also helps keep fish hidden and protected from predators. Examples include large birds of prey, raccoons and opossums. It’s completely safe and nontoxic to fish, pets, and wildlife. This is an ideal product for anybody who wants to offer extra protection for their fish while enhancing the appearance of their pond. Use a bucket or similar container to take 1 gallon of pond water from pond. Shake bottle well and add 5 mL per each 40 gallons of pond capacity to bucket. Gently stir and pour this mixture into pond at several points around pond edge. Wait 5 minutes for the blue to disperse. Re-treat if a darker tint is desired. Use gloves, may stain skin. Re-apply as necessary.